Öffentlicher Eröffnungsvortrag Harald Welzer: "Was zu tun ist, was schon da ist und was wir brauchen. Eine konkrete Utopie der Transformation"
The Working Group for Development Studies and Sustainability Science at the Institute of Geography, University of Innsbruck aims at developing new ways of understanding and approaching social, economic and environmental sustainability in both, research and teaching. The empirical research activities are actor-oriented, taking into account uneven power structures and social inequalities. The thematic priorities are North-South relations and development, transitions towards regional sustainability and human-environment relations. In the sense of an engaged geography, which takes an unequivocal stand on current challenges and moreover questions existing power and disparity relationships, we try to put an emphasis in our research on the protagonists and their actions. 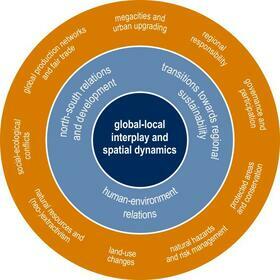 The current thematic priorities are sustainable regional development, human-environmental relations and the processes of change in urban and rural regions. The regional focus mainly lies on South America (Brazil, Amazonia), the Alpine region and recently also Southern Africa and South-East Asia.